A unique table top tool, the Chopstick Master™ allows anybody, regardless of experience, age 8 and up, to make a pair of gallery quality chopsticks. This original design utilizes a Japanese blade to form the finials on the end of the Chopsticks. Professional quality tool made primarily of anodized aluminum parts. Precision Mini Block Plane for superb finish; honing guide and abrasive strip easily allows you to keep the plane in top shape. It provides a unique woodworking experience for anyone, even those with zero woodworking experience. Easily accepts your own homemade chopstick blanks (7mm x 7mm x 270mm). What size chopsticks can I make with the Chopstick Master 2015, Version 1 (the original)? 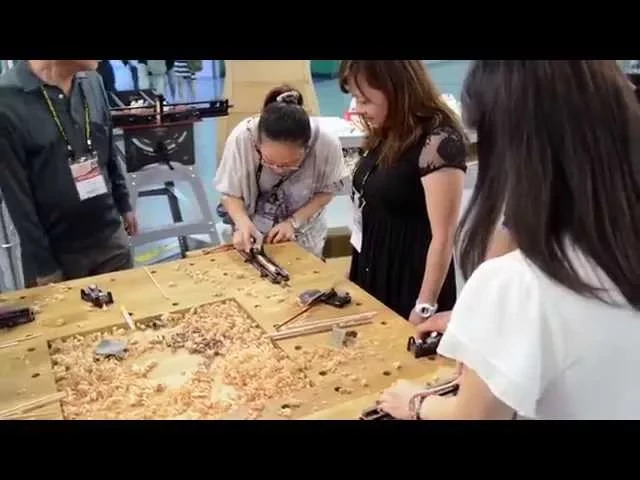 You can make both Chinese Style and Japanese Style chopsticks with the Chopstick Master 2015, Version 1. 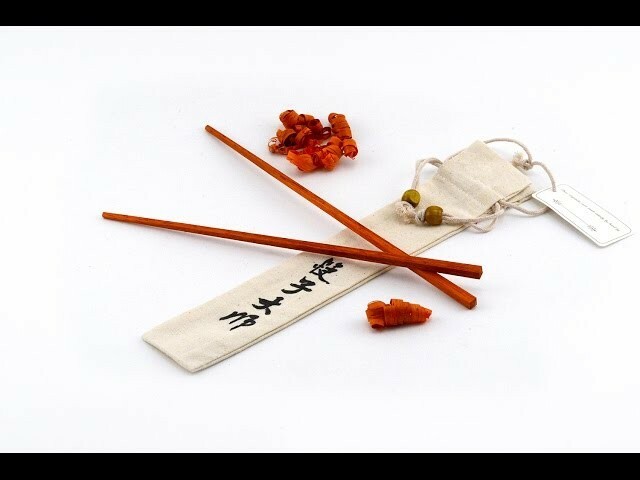 The kit comes with a red arm for making Chinese Style Chopsticks which are a 5mm octagonal tip. It also comes with a green arm for making Japanese Chopsticks which are a 2mm octagonal tip. The Chopstick Master Version 2 comes with the Red Arm and you can buy the Green Arm as an accessory. How many chopstick master blanks come with the Chopstick Masters? There are enough blanks in the box to make 10 sets of chopsticks. In addition, there are 5 red bags and 5 blue bags to hold the chopsticks. What if I run out of chopstick master blanks. Can I purchase more chopstick blanks? Yes. Bridge City Tool Works carries several different types of blanks in a set of 10 including Teak, Maple, Walnut, Ceylon Iron Wood, Padauk and Cherry. (Depending on availability.). Can I make my own chopstick blanks? Yes. Each chopstick starts out at 270mm x 7mm square. There are videos on the internet explaining how to make your own blanks. Why would I use the 50° Honing Guide? If you are making your own blanks out of scrap bin or if you run across wood with difficult grain encounters. What is the Flat Stock Arm (blue) used for? 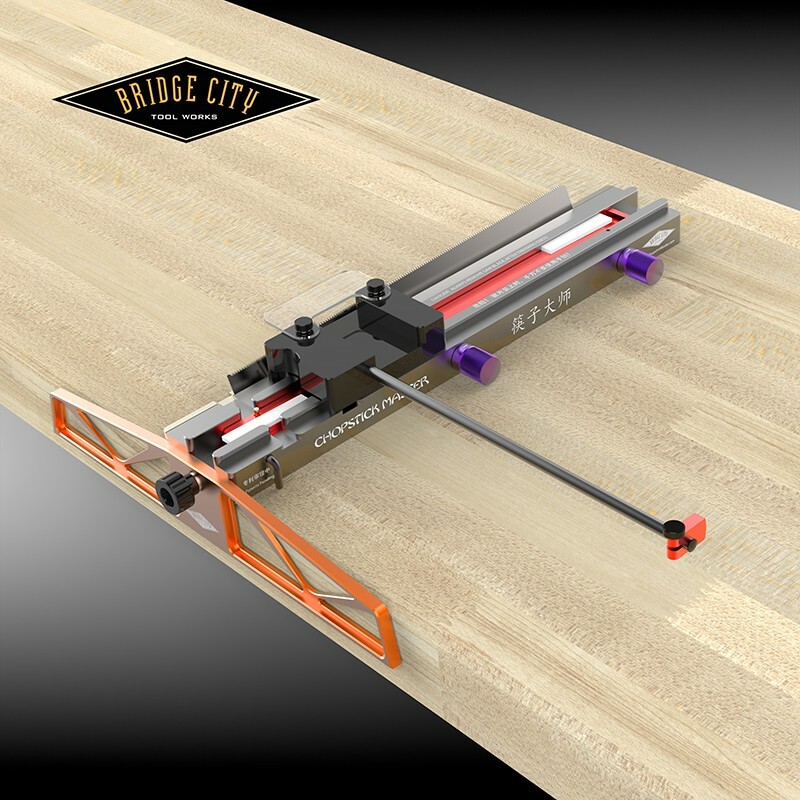 The Flat Stock Arm (blue) is used in conjunction with the HP-8 plane and will allow you to thickness plane banding, inlay strips and other thin stock requirements down to .06" thick. Its also great for Kumiko projects. What can I do to alleviate tear out when making my finial cut? There are a few things that could cause tear out, which probably happens at the corners of the diamond finial. Here are a few things you can try: 1. Ensure that your plane iron is sharp since you want clean cuts. A dull blade will pull the grains rather than cut. 2. Make sure your plane is set to do fine cuts (closed mouth with a shallow depth of cut). Lighter cuts will less likely to tear out than rougher/deeper cuts. 3. Since you are working with end-grain, some types of wood will be more likely to create tear outs than others. Be careful with harder or "grainier" woods because they are more likely to chip/tear out. 4. Lastly, be gentle with your cuts! The process of planing the diamond finial should be a motion of gentle skew cut with minimal back and forth cutting motion. Let the blade do most of the work. You are only applying gentle pressure. The Chopstick Master™ allows anybody, regardless of experience, age 8 and up, to make a pair of gallery quality, flawless chopsticks. Each chopstick starts out as a 270mm x 7mm square blank. When completed, it becomes a gracefully tapered and perfectly proportioned chopstick that is square on the outboard end and transitions to an impeccable octagonal tip either 2mm or 5mm in diameter. The finish of the wood, because it was cut with a block plane, is as smooth as you can make wood. The final touch, a pyramidal finial, is cut with Japanese blade which is mounted on the side of the Chopstick Master™. This cut elevates the chopstick from amateur to professional status. It is possible for one’s very first woodworking project to be perfect even by someone with ZERO woodworking skills. 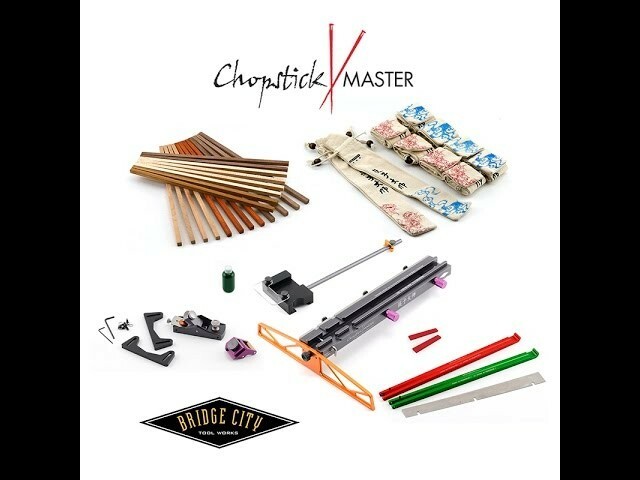 The Chopstick Master™ comes complete with enough blanks to make 10 pairs of chopsticks, and when you divide the cost of the kit by 10, you can get a ball park cost for a pair of chopsticks. Over a period of time, as you make more and more chopsticks, the initial cost of the unit becomes almost negligible. Currently in the U.S., hand-made finished chopsticks are retailing around $60, and they can go much higher. For those of you who have a creative voice that needs to be heard, chopsticks make a great platform for expression. They can be painted, air-brushed, gilded, lacquered, embellished, and the list goes on. We have seen chopsticks in both China and Japan that are well north of $500. They make terrific gifts. 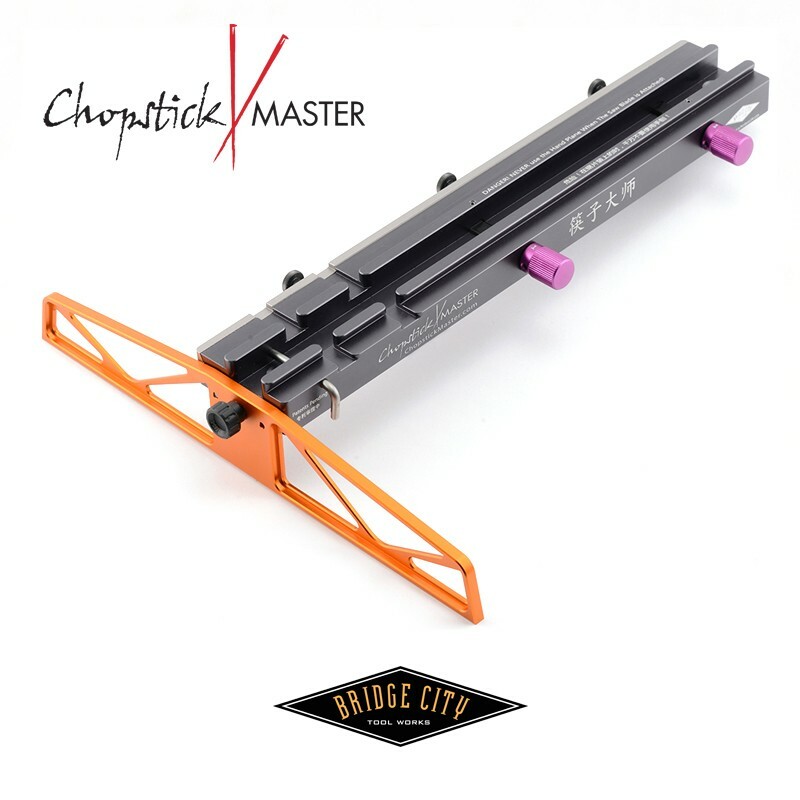 The Chopstick Master™ is a professional tool with an all metal base and is designed to last multiple generations.